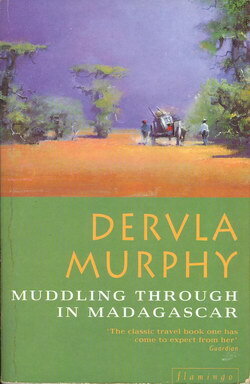 I had been hunting for Dervla Murphy's Muddling Through in Madagascar for a very long time. After visiting all local and not-so-local libraries, I eventually had to place a special order for the elusive volume and wait until it gets dug out from some warehouse who-knows-where. Not surprisingly, the book proved well worth the effort. I don't think I've ever seen a travel book about Madagascar - up until now, anyway. The country definitely counts as 'an exotic location'. The very sound of the name conjures images of tropics and adventure. Murphy's travelogue only confirms this effect. Sure as hell, Madagascar is a strange country. While some things may have changed since 1985 (when Muddling Through in Madagascar was first released), I'm sure it remained as charming and baffling until today. A few aspects of Malagasy life stay in memory after reading Dervla's travel diary. Laid-back, friendly and stress-free people. Fauna (mainly the lemurs, of course) and flora, which you can in vain look for anywhere else on Earth. Wretched state of the country's road network: some of the Murphies' (once again, Rachel Murphy got on the road with her Mum) transportation crusades can only be described as surreal. Mind-blowingly complex language. Dangerous spirits - and I mean it in more ways than one, all of which will become clear once you read the book. Few anti-Western rants are included in this particular title, which is very unlike Dervla. Possibly that's because of her hope that due to specifics of Malagasy character and culture, the country might prove relatively immune to the so-called blessings of civilisation. It would be interesting to find out whether the author's feelings proved true - if you happen to know, please leave me a note! Otherwise, I've already run out of superlatives to describe Dervla Murphy's writing. As far as I'm concerned, it's flawless. Praise does not get higher than that.